Why Did Ashoka Convert to Buddhism? The conversion of the Mauryan Indian King Ashoka (ruled 272-231 BC) to Buddhism is rightfully viewed as a significant turning point in world history. 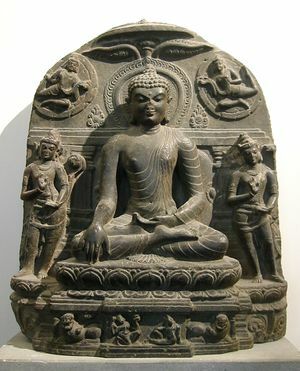 Ashoka promoted the fairly new philosophy of Buddhism throughout his realm and allowed it to flourish, which eventually led to its dissemination throughout east Asia. Among the most visible ways in which the king promoted Buddhism was by erecting numerous pillar and rock edicts that detailed his version of Buddhist theology and by constructing numerous Buddhist monasteries, known as sutpas. Throughout India, they were used to house religious texts and relics. Before Ashoka converted to Buddhism, though, he was known to be a particularly brutal king who had thousands of people killed with impunity. The difference between Ashoka’s early and later life are striking and leads to the self-evident question – why did Ashoka convert to Buddhism? The answer to that question can be found in the primary source material. All sources indicate that Ashoka’s conversion to Buddhism was legitimate, but the edicts and other inscriptions the king commissioned seem to suggest that it was part of a gradual process that was influenced by the older Indic religions but was ultimately the result of guilt over the lives he took early in his life. On the other hand, the Buddhist sources depict Ashoka’s conversion as more sudden and the result of immediate enlightenment. Although the sources may diverge on the process that brought Ashoka to Buddhism, they both seem to point to the pivotal and bloody war against the kingdom of Kalinga as a turning point. 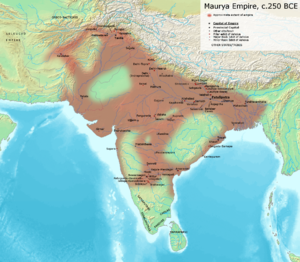 The dynasty and empire that Ashoka ruled over are known for its founder, Chandragupta Maurya (reigned 324-300 BC). Chandragupta, who was known by the Greeks as “Androcottus,” established the empire in 321 BC by taking lands in northwest India that were left vacant as a result of Alexander the Great’s failed attempts to conquer that region. Once the Mauryan Empire was established, it served as a bridge between the east and west. The early Mauryan rulers forged particularly close connections with the Hellenistic Seleucid Dynasty that was based in Mesopotamia. Some royal marriages were made joining the Greek and Indian rulers and Greek philosophers and intellectuals, such as Megasthenes and Deimachus, served at the Mauryan court. The relationship between the Seleucids and Mauryans was mentioned by the first century AD Greek historian, Plutarch, who noted how the Indian king established his dynasty and furnished the Seleucids with war elephants, which they used against the other Hellenistic kingdoms in the west. After Chandragupta died, his son and Ashoka’s father, Bindusara, came to the throne in 297 BC. He was known by the Greek historians as “Amitrochates” and ruled until 272 BC. If Bindusara taught Ashoka one thing, it was how to be a ruthless conqueror. Bindusara exterminated the kings and nobles of sixteen cities and subjugated India from the Indian to the Pacific oceans, establishing what would be the boundaries of the Mauryan Empire for nearly 100 years. In fairness to Bindusara, his use of violence was probably more of a reaction to the cruel governors who caused rebellions within their realms more than it was a love of wanton violence on his part. Still, there is little doubt that Ashoka learned from his father at an early age that violence could be an effective method to keep and hold power in an often chaotic region of the world. Once Ashoka was in power, he continued to demonstrate his martial abilities and tendency for brutality toward all who opposed him. One of the kingdoms in India that Ashoka had yet to conquer by the eighth year of his rule was Kalinga, located on the Bay of Bengal. The war between the Mauryan Empire and Kalinga ebbed and flowed for the first few years of Ashoka’s rule until the king utterly devastated Kalinga in his eighth year of rule. 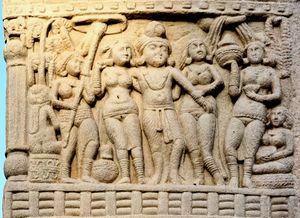 Ashoka commemorated his victory over Kalinga on two rock edicts, stating that 150,000 people from Kalinga were deported, 100,000 were killed, and many times later died as a result from injuries, starvation, etc. The numbers would be incredibly high by even modern standards, but modern scholars have stated that archaeological evidence seems to corroborate the claims. Violence was a tool that Ashoka used his entire life to get what he wanted, but after the war with Kalinga, he finally contemplated the extent of human suffering that he had caused. 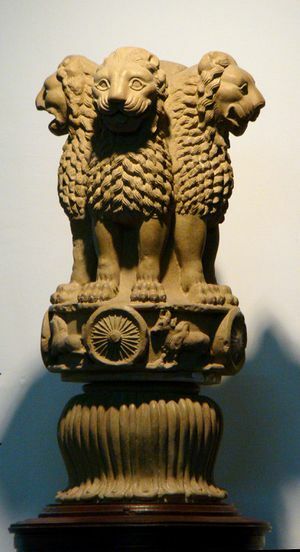 Most modern scholars of ancient India and early Buddhism believe that a close examination of Ashoka’s rock and pillar edicts reveals that the king did not promote a form of Buddhism that one would consider to be in either the Theravada or Mahayana tradition, but more so in line with the earlier Indic religions. Before becoming a Buddhist, Ashoka, like most Indians, followed the Vedic religion, but members of his family were also Jains and Ajivikas. The rock and pillar inscriptions indicate that Ashoka drew heavily from the theology of all Indic religions, but was profoundly affected by the events in the final battle against Kalinga, which pushed him closer to Buddhism. The Sanskrit language Buddhist text known as the Asokavadana, or “narrative of Ashoka,” was written hundreds of years after Ashoka’s death and therefore somewhat of a “pseudo-historical” source, but is an important text when considering how the Buddhist community viewed the conversion of the emperor. According to this text, Ashoka’s rule of India and his eventual conversion to Buddhism was preordained in a previous life. The Asokavadana agrees with the edicts and archaeological evidence that Ashoka was a particularly violent king, but adds details about his cruelty. For instance, the Asokavadana states that Ashoka had his concubines regularly killed for minor affronts and he built an elaborate torture chamber based on the Buddhist version of hell. But unlike the historical sources, the Asokavadana asserts that Ashoka’s conversion to Buddhism was the result of sudden enlightenment instead of a gradual process. The passage in question describes how Ashoka attempted to torture and kill a Buddhist monk, but was instead brought to Buddhism. Ashoka was one of the most important personalities in the ancient world and arguably the most important person in pre-modern Indian history. He controlled a vast empire that encompassed most of the Indian sub-continent and patronized the Buddhist religion, helping make it one of the greatest and most followed religions of the world. The reason for Ashoka’s conversion to Buddhism has always been a source of interest and debate for scholars, Buddhists and lay people alike since he seemed to make such an abrupt turn in morality once he converted. The rock edicts and pillar inscriptions seem to indicate that Ashoka’s conversion to Buddhism was fairly gradual and was influenced by a combination of the earlier Indic religions he was in contact with daily and guilt over his cruel acts early in his reign, especially the final battle with Kalinga. The later Buddhist Asokavadana also depicts Ashoka as suffering from guilt due to his violent and despotic rule but portrays his conversion as a more sudden form of enlightenment. Although the two traditions diverge on the process that Ashoka took to his conversion, they both agree that it was the result of a guilty conscience with the final battle against Kalinga being the turning point. 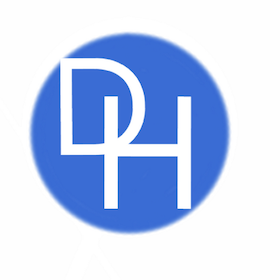 This page was last edited on 10 January 2019, at 01:43.